We caN grow in both relevance and excellence while upholding what we know to be best for our children. As we move toward end of another great school year, we are excited for what the future holds with Jeremy Case as our head of school beginning in August 2019! Jeremy grew up in Perimeter Church and attended Perimeter School. He graduated from Furman University with a degree in history and licensure for teaching social studies in grades 6 through 12. He has been on staff with Perimeter Church since 2004, most recently as the director of KIDS Town, giving leadership to the ministry of children in Perimeter Church from birth to age 12. While working in this ministry, Jeremy continued to cultivate his passion for teaching and Christian education, leveraging this giftedness in numerous ways. For the past several years, Jeremy has been pouring into Perimeter School in many spheres. 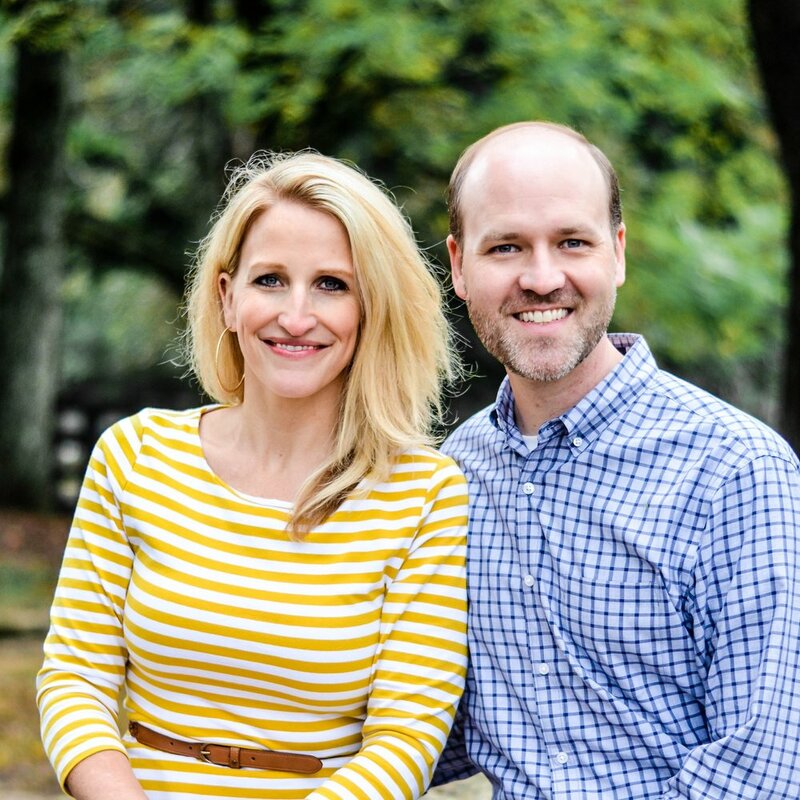 He and his wife, Carolyn, have served on the School Ministry Team. He has taught at many of the school chapels. He has also been active in the classroom, teaching nature study in lower elementary and Bible in middle school. Additionally, this summer Jeremy completes his Master of Education in Educational Leadership from Covenant College. Jeremy and Carolyn have been married for 11 years and are parents to three sons: Cooper (8), Colby (6), and Callum (4). We asked Jeremy and his family some questions, and we are thrilled to get to know them better! Where did you grow up, and how did that influence your decision to work at Perimeter School? I’ve always called Atlanta home. Apart from the few years my family lived in the mid-west when I was younger, I grew up in Peachtree Corners and attended Perimeter School. My years as a student at Perimeter were powerful. This school gave me an incredible blessing – a covenant Christian education. Perimeter School was the gift of life-giving truth, life-nurturing teachers, many life-long friends, and, most importantly, life-changing faith. Throughout those years, the Perimeter family loved and discipled me well. They instilled in me a love for learning and equipped me with a kingdom-mindset. Every person behind the heart of this school pointed me to Jesus and His loving-kindness. It was here, at Perimeter School, that I became deeply rooted in the gospel and God’s grace. Because of my experience as a student and what my wife and I felt to be the best philosophy and place for our family, we knew we wanted to raise and educate our children together with the Perimeter School covenant family. Having been deeply invested in the ministry of Perimeter School for years, I felt God’s prompting and began praying about how God might use me one day to serve in even greater ways and join His work in and through the ministry of Perimeter School. What’s been the educational journey that led you to Perimeter School? When I graduated from Furman Universiy, my career goals were in education. However, after teaching at a high school in South Carolina, God provided the opportunity for me to join the staff team at Camp All-American. What I thought would be a few years of ministry before returning to the classroom has turned into 14 years at Perimeter Church, most recently as the director of KIDS Town. Throughout those years in children’s ministry, I always felt that I would one day return to the other side of Christian education to serve in a school. I knew that if God would call me to do so, I would be overjoyed to serve at Perimeter School. In 2017, I began a three-year graduate program at Covenant College for a Master of Education in Educational Leadership to further my education and experience. Have you always had a passion for ministering to children? My freshman year of college I began volunteering weekly in a South Carolina public school child development center during the school year and working at Camp All-American during the summers. I also served in the children’s ministries at my local church in Greenville and later at Perimeter. During those years, I experienced the blessings of investing in the lives of the next generation and seeing the transformative power of the gospel at work in the lives of children and students. God used these experiences to confirm my calling to serve children and families and develop my passion for ministering to the next generation and turning the hearts of God’s people toward His children. What’s been your favorite thing about being at Perimeter School thus far? I have loved being able to have such a broad and immersive year in the life of our school. In addition to teaching Bible daily and nature study weekly, I have been active in classrooms and enrichment activities in every grade level. A few of my favorites include playing George Washington at Valley Forge with 4th grade and Injun Joe chasing Tom Sawyer with 6th grade. This week I get to play Moses fleeing Pharaoh (played by Bobby Scott) with 1st grade! What has been the most valuable experience you’ve had at Perimeter School? My most valuable experience has been spending lots of time with Bobby. Although I’ve known Bobby for a long time and was even in his discipleship group for several years, I have learned so much from working alongside him this year! What is one thing we can expect as you take the reins in leading Perimeter School? A commitment to both our relevance and excellence. I am convinced that Perimeter School is unique in the wisdom of its theology, philosophy, and curricula foundations. As I think about the future of the school, I also believe these aspects are more vital now than ever before. The foundation which the school provides will allow the next generation to be more outward facing – the ones who will be equipped to extend our reach and who will be prepared to leverage their lives for greater kingdom impact. In order to reach this important vision, the school must be diligent in broadening the appeal and relevance of our programs while remaining true to our timeless foundations and without compromising the tenants of our educational philosophy. I believe we can continue to grow in both relevance and excellence while upholding what we know to be best for the character and education of our children. Change must originate from the pursuit of progressing our vision and how we can best partner with the parents of Perimeter Church to be a place where children thrive in their education and spiritual formation. I’ve had the privilege to travel to England, France, Spain, Germany, Austria, Switzerland, the Netherlands, Italy, Egypt, Bermuda, the Bahamas, Australia, and New Zealand. While it’s difficult to choose a favorite, I enjoyed Italy the most. Both! Always black coffee in the morning and decaf tea in the afternoon. Although I think it would be amazing to fly, I would choose some kind of marine animal. Since 70 percent of the earth is covered by ocean, it would be amazing to explore the vast expanse and depths of God’s creation underwater! 1. Marching Off the Map: Inspire Students to Navigate a Brand New World by Tim Elmore. I’m passionate about the mission of the church, and I’m excited about the uniquely vital role the school plays as a ministry of Perimeter Church. I’m passionate about covenant Christian education which equips our children for gospel living, both in the church as well as in the culture, both for their future but also their daily lives. I believe the school is essential to discipling the next generation for kingdom impact. The school is where life-on-life relationships are cultivated. The school is where godly disciplines are instilled and hearts transformed. The school is where servant leadership is modeled, a biblical worldview shaped, and a kingdom mindset informed. I am convinced that it is out of the school that our church will raise up lifelong disciple-makers and externally focused difference-makers. The school is paramount in equipping our children to understand their role and purpose in cultural renewal and gospel living. A fresh seafood feast in Alexandria, Egypt, on the coast of the Mediterranean Sea. Tanzania! I have been so encouraged hearing about the ministry in Karanse and our school’s partnership with Pastor Wariaeli. I look forward to the opportunity to visit and be a part of what God is doing in Tanzania. Let’s grab a cup of coffee and talk. Advent! Our family loves the daily anticipation of counting the days and lighting the candles so that our hearts can prepare Him room during the busyness of the Christmas season. We love reading the scripture, telling the story, and singing the hymns and carols by the flickering glow of candlelight. What’s your funniest memory as a student at Perimeter School? People might not realize that you have had a role on Perimeter School staff for years. Tell us about what you do. I started working with the school in 2011, most recently as a library assistant. It has been a joy to get to know the children, teachers, and parents who come to the library. Why do YOU love Perimeter School? I love Perimeter School because, not only are my boys getting a great education, they are being taught the truths of the gospel. We love partnering with this covenant community to bring our boys up to know the truths of the Bible and to ultimately make kindgom impact. We know they are loved here, and it feels like family in this place. We are so thankful! Aside from faith, family, and friends, what are three things you can’t live without? Dark chocolate, Chick-fil-A tea, and almond milk lattes. I worked for Disney! No, I was not a character ;). I worked both in Hilton Head Island at the Disney resort there and then in Orlando in the recreation department and Disney Vacation Club. It was very fun! Where did you and Jeremy meet? Jeremy and I met while we were both on staff with Camp All-American. Camp All-American is the place to be… and a great place to meet your spouse! Colby: Superman because he can fly! What are you most excited about in having your dad work at Perimeter School? Cooper and Colby: He gets to bring us to school every day, and we get to see him a lot! What’s your favorite thing about your dad? Cooper: He builds Legos and plays games with me. Callum: He reads me books and plays Uno. If you could come home and have any new toy waiting for you in your room, what would it be? Cooper: A humongous Lego set or a strategy board game. Callum: A Thomas train set. Cooper: Trio’politan (vanilla, chocolate, and mint chocolate chip). Colby: Trio’politan (vanilla, chocolate, and mint chocolate chip). Callum: Coconut Milk Vanilla (Callum is allergic to nuts and dairy). We can’t wait to see what God has in store for Perimeter School. Join us in praying for Jeremy, his family, and our school as we move with excitement into the years ahead!